Legally Record, Convert & Enjoy Movies, Video Streams and DVDs. With Audials Moviebox, a button appears next to videos & films in any browser or stream player that lets you record unprotected videos and protected movies, e.g. from Video-on-Demand services. 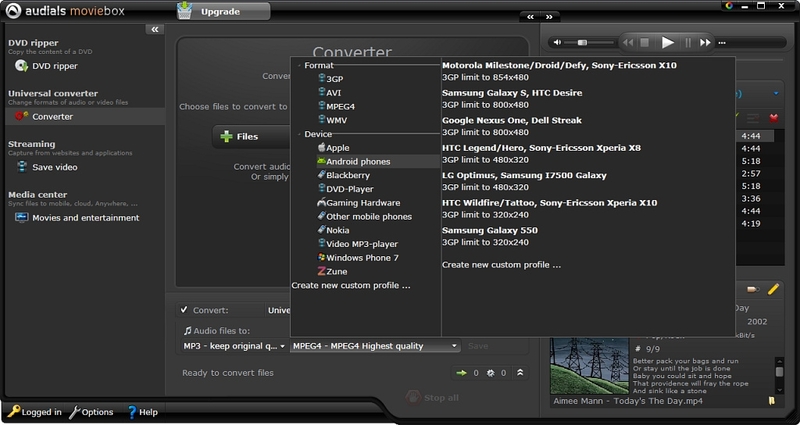 Audials Moviebox also takes care of all file-formatting issues for your downloaded movies. Tablets, netbooks and other portable devices, oftentimes do not possess the capability to playback movies on DVD. Audials Moviebox can read in DVDs directly or create a copy of protected DVDs for your archives via the re-recording process without sacrificing any quality, and gives you these files in the right format for any of your devices. Keep from Losing your DVD Collection with Private Copies! The shelf life of purchased DVD is oftentimes limited despite careful use and proper storage. Audials lets you easily rerecord and archive your movies on DVD. Shows and movies recorded from your TV with set-top-boxes or by using the recording function of a hard drive recorder are typically recorded in the TS video format, which prevents them from being viewed on either your PC or any other device. Audials Moviebox converts TV recordings from the TS format into a compatible format for any device. Video files and recordings are optimally converted and saved in the right format for your PC, notebook, smartphones, tablets, netbooks, PS3, Xbox etc. 30 Seconds of Converting. Recording free.